This airticle contains leets o baith the lairgest ceeties an lairgest municipalities in Mexico. See an aw the leet o Metropolitan auries o Mexico. This is a leet o ceeties in Mexico bi fixed population, accordin tae the 2010 Mexican naitional census. Localities dae no hae separate govrenments, but are unner that o their municipality. Urban localities, housomeivver, are wha maist fowk define as ceety syne maist municipalities in Mexico, like maist coonties in the Unitit States, consist primarily o lairge landwart auries in addeetion tae relatively smaw amoonts o urban laund whaur the lairgest proportion o the population uisually lives. Note that baith Veracruz an Naucalpan cross municipal lines (are each locatit in twa different municipalities). Note that Mexico Ceety contains aw o the Distrito Federal's aurie an aw, includin landwart auries wi relatively minor populations. 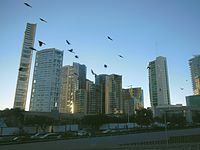 The Distrito Federal's population is classifee'd (bi localities athin its burghs) as 8,810,393 urban (99.54%) an 40,687 landwart (0.46%). Aw ither localities are offeecially classifee'd as solely urban bi Instituto Nacional de Estadística y Geografía (INEGI). Aw o the map links are at the same scale. 7 – Ciudad Juárez, Chihuahua. 10 - Ciudad Nezahualcóyotl, State o Mexico. 26 – Cancún, Quintana Roo. 29 - Chimalhuacán, State o Mexico. 43 – Ensenada, Baja California. 74 – Puerto Vallarta, Jalisco. 84 – Ciudad del Carmen, Campeche. The follaein is a leet o the maist populous incorporatit places in Mexico as o the 2010 census. As defined bi the Mexico's Census Bureau the Naitional Institute o Statistics an Geography (INEGI bi its name in Spainyie, Instituto Nacional de Estadística y Geografía). Note that this leet refers anerly tae the population o individual municipalities athin their defined limits, which does no include ither municipalities or unincorporatit suburban auries athin urban agglomerations. This page wis last eeditit on 28 November 2015, at 21:31.